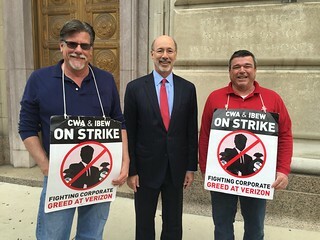 Today, Wednesday, May 11, 2016, Pennsylvania Governor Tom Wolf visited CWA members on the Verizon picket line and released a statement in support of working families on the line. Read Governor Wolf's statement here. PA Gov. Tom Wolf visits the Verizon picket line.